It’s one thing to read about how Crosby sets the standard for the highest-quality rigging and lifting products in the industry—it’s another thing entirely to see it. 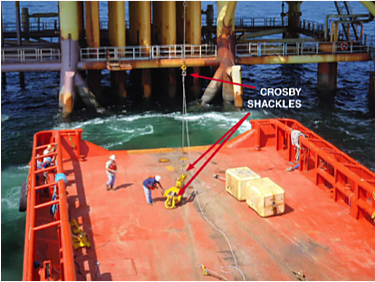 The following images provide a glimpse into the multiple applications of Crosby shackles across the subsea sector. Companies across the globe turn to Crosby when it comes to selecting products of superior strength that will withstand the long-term physical demands associated with subsea endeavors. Whether the task involves installing a pipeline 2,400 feet (732 metres) below the surface of the ocean or lifting equipment hundreds of feet into the air above an offshore platform, Crosby considers every lift to be critical, which is why Crosby products are some of the most dependable and recognizable in the subsea sector—as the following images illustrate. In the subsea sector, navigating rough seas has always been part of the job. However, in recent years, navigating rough markets has demonstrated to be an equally challenging task. 2014 proved to be particularly challenging as the oil and gas industry plunged headlong into a spiraling succession of declining oil prices and rising production costs. With an equally volatile forecast predicted for 2015, the subsea sector is currently faced with the challenge of keeping afloat until industry economics improve. Based on current research, it appears that the subsea sector will need to buckle down and ride out the storm—at least for the short term.